much love, illy: CLOSED - sponsor love + giveaway with Simply Bold. happy birthday to my beautiful mom + friend. a rocking July group giveaway!!! i wanna be really, really real today. and so i tip my hat to you, good people. um, i can't keep my eyes off of you. sponsor love + giveaway with Saturated Canary. who is ready to arm partaaaaaaay?! lily rose and that big ole number one. sheer joy in the name of cotton candy. on giving up my membership. CLOSED - sponsor love + giveaway with Simply Bold. 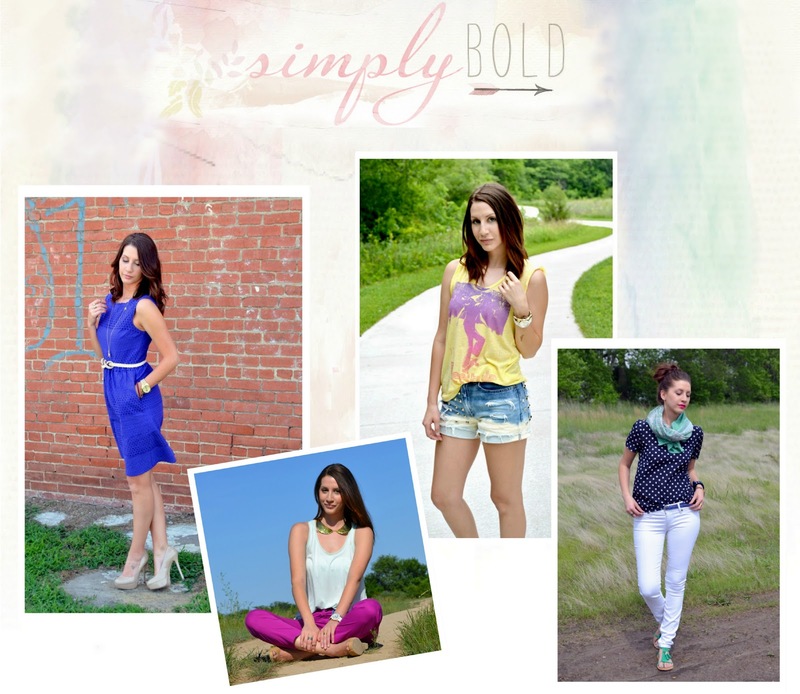 meet kristina of simply bold. Hi friends of Ilene! My name is Kristina, I am a nurse who needed a creative outlet...enter Simply Bold, my blog where you can expect to find pieces of my style, life, do-it-yourself projects and little loves along the way. I love to stretch my closet, without stretching my wallet, and make my pieces work in different ways. My style can be described as urban renewal, meaning I enjoy classic pieces with a twist, refreshing vintage loves, and mixing patterns & textures...there's no rules around here and if you think there are, it's time to break them! Simply Bold was one of those blog that i stumbled across on some random day and thought, where have i been all my life and not reading this blog?! i am a personal fan of Kristina - and am obsessed with her refreshing, sophisticated, and colorful touch on the latest fashions. i also think her thursday latelies are some of the cutest ones that i have watched. so if you are looking for a brand-new refreshing lifestyle or fashion blog, look no further, people! Simply Bold is the IT blog! and you know me - i do not tell lies. 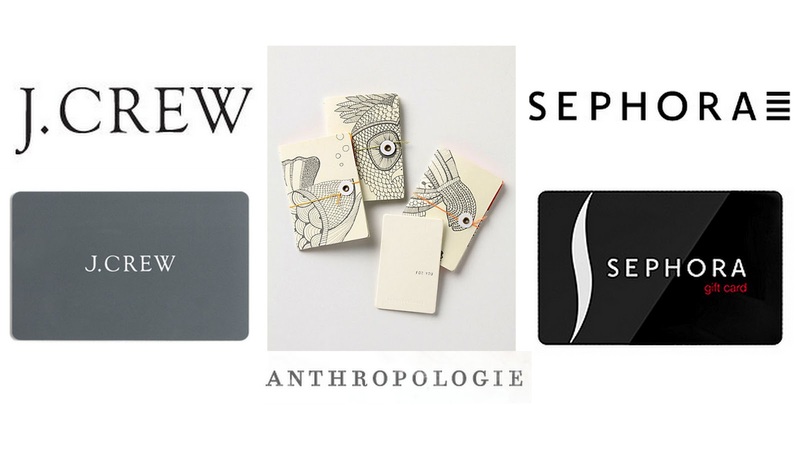 today the gorgeous Kristina is giving away $25 gift card to ANY of the following stores listed above - J.Crew, Anthropologie, OR Sephora! And not only that, she is also giving away Large Ad Space and a Feature spot (valued at $25) to her darling blog! talk about JACKPOT to win BOTH! Get 25% off of Simply Bold Ad space NOW! email Kristina at kristina at simplybold dot com to reserve your spot! find sponsorship info HERE. Giveaway is open to ALL Much Love, illy readers thru July 16th. Winner will be announced on July 17th. I follow Kristina on Instagram! and i'm a follower of your lovely blog! I follow Simply Bold on GFC! I follow Simply Bold on Bloglovin! i'm a follower of simply bold! I follow Simply Bold's blog! Following you and her on Twitter. im a gcf follower of simply bold! im a gfc follower of your blog! i follow simply bold via bloglovin'! Following Simply Bold on GFC. Following you on GFC. Thank you! i follow you on gfc as well! How was I not already reading her blog???? Love it! I follow Simply Bold via GFC! I'm also a GFC follower of your blog. And I follow you both on twitter too (I'm @shealennon). I followed Simply Bold via GFC. I followed Simply Bold via Bloglovin. I follow Simply Bold via GFC!!! I follow both on twitter-kellybb31. Following Simply Bold on Bloglovin'. I love love love Krystina a ton and am definitely following her blog! following simply bold on bloglovin! I follow Simply Bold via Bloglovin! i'm a gc follower of simply bold! i became a follower of Simply Bold! i am also a follower of illy's blog. always has been. i follow both @muchloveilly and @simplyboldblog on twitter! I follow this blog on GFC too!! I follow Kristina on Instagram. and I follow this blog via GFC! I follow Simply Bold with GFC! I follow Simply Bold with Bloglovin! I am a public follower of Simply Bold on GFC (Carolsue).